The ladies in my Bible Study decided to hold a Craft Night last Friday, so I decided I to find a project to make music-y valentines for my piano students. However, when I googled and checked Pinterest for music-themed Valentine ideas, I came up empty-handed. So, I decided to design my own piano valentines. I designed the grand piano shape and keyboard in Microsoft Word, and then printed the pages out on red, pink, and white cardstock paper. After cutting everything out, I embellished the piano lids with foam stickers and felt stickers. Using a glue stick, I glued the keyboard onto the piano shape, and then glued the whole piano onto the box of Sweetheart candies. There is even a stick to hold the piano lid open! That part is optional. To make this project a little simpler, you could skip the stick if desired. 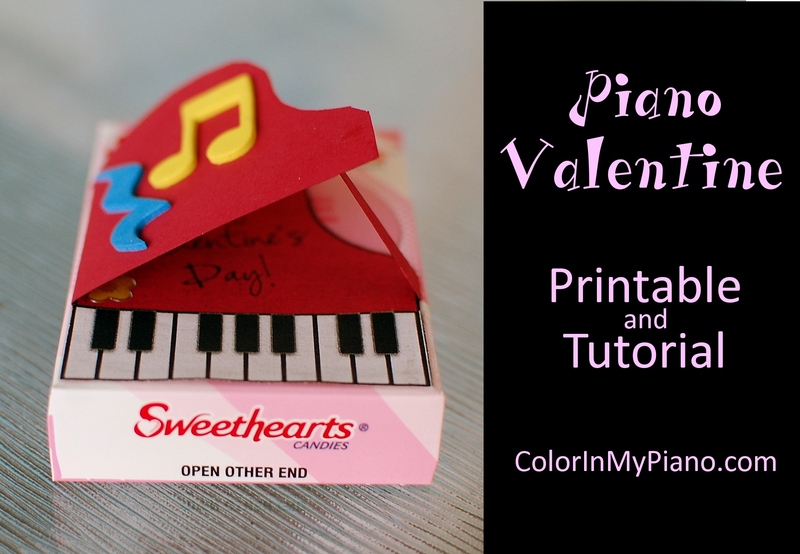 To download the free pdf for making these valentines, visit the Printables > Other Resources page and scroll down to P’s for “Piano Valentine Printable.” Directions are included in the pdf. Enjoy! UPDATE #2: To see another piano-themed valentine printable I designed, check out this post! Oooh … SO cute! I made this (http://girlsinwhitedresses.wordpress.com/2011/02/09/easy-valentine-candy-treat/) last year, and planned to repeat this year, but hmmmm … I do love these. I may have to switch. Thank you so much! I kind of liked the Musical Heart Art game, but wasn’t exactly satisfied… Thanks for sharing your creativity. These are adorable. Now, looking for time to make 95 of them for all of the students in my studio. Joy, these are super cute!!! I may have to make these for my students… Thanks for sharing! I agree with the other persons! For Valntine’s day, what an original, beautiful and irresistible idea for a pianist. This is SO cute! Thank you so much for posting the instructions and the excellent photos! These are adorable- definitely going to give these a try! So cute! I will use these for my Kindergarten Class. Thank you! Love this…my students will really enjoy these. Thank you! What a wonderful and inventive idea. I cannot wait to make these and give them to my students. I might even make them for my early childhood music students. Hi There, very nice idea, may I use this tutorial and images in my site? in exchange i create a backlink to your site. You may use a photo and then link to this post, but please do not copy and paste my whole post into your website. Thanks for your interest! Just printed off a set to make for my students. Thanks so much for sharing this cute idea (and the template)! The mini pianos are so cute – thanks for sharing! I just printed these adorable little piano valentines. Such a simple to use template and clear directions. I have used many of your free printables in my new studio and both my students and I have loved every one of them! Thank you so much for sharing your creativity and inspirational ideas with all of us teachers. Thanks so much for the kind words, Jill! Made my day! Just wanted to stop by and say I LOVE your Valentine. We featured it in today’s Sassy Quest on Liberace Day too! Awesome creativity. Love it.